Yossi Milo Gallery Announces Expansion; New Ground-Floor Space Will be Added to Existing Gallery. Yossi Milo Gallery is pleased to announce the opening of an additional ground-floor gallery space. Located steps away from the existing gallery (525 West 25th Street), the new gallery is at 531 West 25th Street (in the space formerly occupied by ClampArt) and will be called Yossi Milo Gallery North. The new gallery space will function as both a public exhibition space, with three or four shows each year, and private viewing room. Yossi Milo Gallery North will be open to the public Tuesday – Saturday, 10am – 6pm. Yossi Milo Gallery will inaugurate the North Gallery with an exhibition of color photographs by Indre Serpytyte entitled “A State of Silence”. The opening of Ms. Serpytyte’s show in the North Gallery will coincide with the opening of an exhibition of Takashi Yasumura’s photographs in the existing gallery. All of the photographs in Takashi Yasumura’s series Domestic Scandals were taken in his middle-class parents’ Japanese home over the course of seven years. Images of simple interiors and common domestic objects, such as rolls of toilet paper, a stapler or a plastic bowl of oranges, juxtapose traditional Japanese sensibility with modern, often manufactured Western elements, making the everyday appear alien, hyperreal and humorous. Ms. Serpytyte’s series was inspired by the mysterious death of the artist’s father, who had been a minister in the Lithuanian government. The family was informed that he died in a car accident and was given few details about the circumstances surrounding his sudden death. Faced with a lack of information, Ms. Serpytyte began what she refers to as “indefatigable investigations” into what happened to her father and to begin this series of still-life photographs. 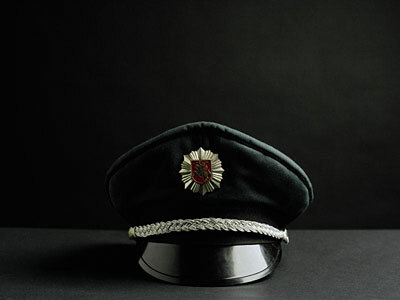 The artist transforms what might otherwise be seen as mundane items of daily life – an officer’s cap, an old-fashioned typewriter, a telephone wrapped by its cord – into signifiers of loss. The 20″ × 24″ glossy C-prints depict single objects against ambiguous, dark backgrounds. Ms. Serpytyte was the recipient of a Jerwood Photography Award in 2006. The artist was born in Lithuania in 1983, received her BA from the University of Brighton in 2006, and currently lives and works in London.